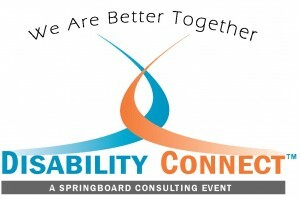 MENDHAM, NJ (11/2113) - #Springboard Consulting, LLC is excited to produce the #2014 #North America Disability Connect Forum & Awards. A first of its kind event, #Disability Connect is for disability and #LGBT Employee Resource Group members, leaders and their sponsors to collectively collaborate to address their common issues, intersections and resulting opportunities and in doing so, creating a more inclusive workplace. Disability Connect is a one-day forum that will provide attendees with the perfect platform to better understand each other’s issues, make powerful connections, share best practices and formulate strategies aligning with the theme of #“Communities in Common:” LGBT & Disability. "We are honored to have Genentech serving as the Host of this inaugural event,” said #Nadine Vogel, Chief Executive Officer of Springboard Consulting. “Their hosting speaks volumes about their commitment to both the LGBT and disabled communities within their workplace." This thought provoking, interactive, highly informative event will include the “Communities in Common” Luncheon and Awards Presentation which will feature Geri Jewell, a very funny; yet, inspirational keynote speaker, and the highlight of the luncheon and presentation of the "We're Better Together" Award. This honor is bestowed on a company who has demonstrated commitment to the Disability Connect Mission through exceptional programming, sound organizational practices and success relative to the partnership between their Disability and LGBT ERG's. We hope you will join us on February 25, 2014 in San Francisco for what is sure to be a highly educational, inspirational and powerful event. Companies interested in becoming a proud sponsor, purchasing tickets and/or applying for the "We're Better Together Award" will find additional information by visiting https://consultspringboard.com/category/disability-connect-2014-us/. Additional information about the Disability Connect Forum can also be obtained by contacting Jill Frankel: T: 973-813-7269 x106; E: jill@consultspringboard.com.